The problem is not being Shia or Sunni leaders too. Iraqi Allawi is a Shia but he is a loyal dog servant of USrael, The Iraqi Tareq Hasheme is Sunni too but he is also a dog puppet of USrael. It is high time we all woke up and come together. It is high time for us to UNITE with muslims and oppressed people against enemies of Islam and humanity. If we keep up this discussion be sure that ıt is enemies of Islam, humanity that will be pleased and they will be happy with the strife among us. At this point we need to know what Islam is and what American Islam (Fake Islam) is too. VERY IMPORTANT: This is simply what Jehad means and who is called Mujaheed! 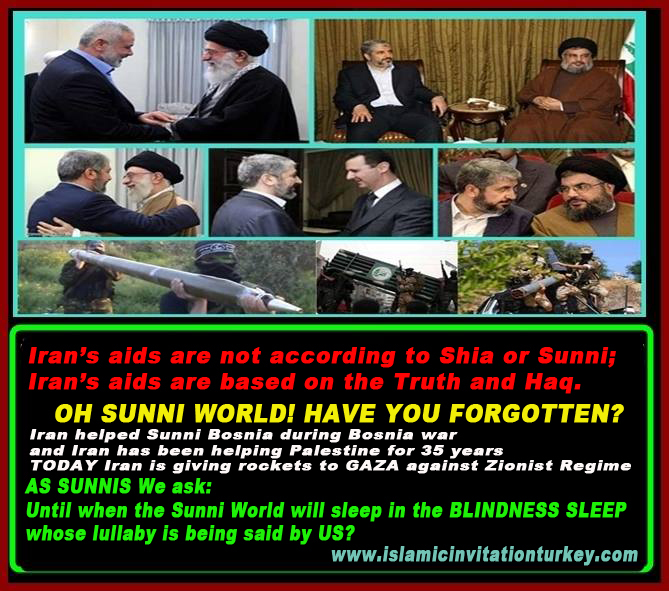 We Sunnis ask: Where are Sunni Governments for Gaza while Shia Iran is giving missiles, arms, aids to Palestinian Resistance? Photo: Turkish University Students’ Blankets are in Syria, heating Terrorists’ backs!